Wen Ying He was killed in the rear of her family’s home on Suydam Street near Cypress Avenue. 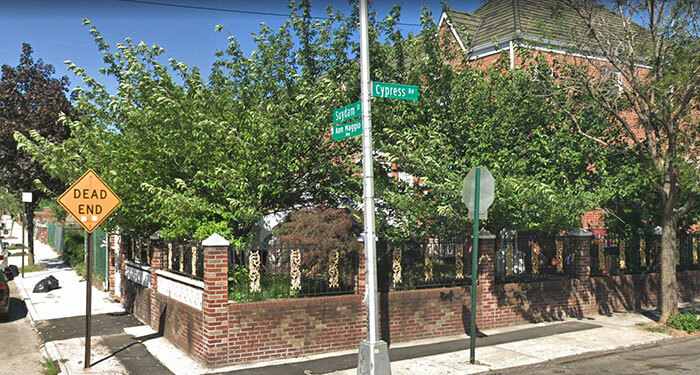 A borough grand jury has indicted a Flushing man for the savage fatal stabbing of his daughter-in-law in broad daylight on the streets of Ridgewood last month, Chief Assistant District Attorney John Ryan on behalf of Queens DA Richard Brown, announced on Friday. Dahe Lin, 76, has been arraigned on an indictment charging him with second-degree murder and fourth-degree criminal possession of a weapon. According to court records, a psychiatric exam has been ordered as Lin remains remanded in the custody of the City Department of Correction. His next court date is scheduled for May 7. According to the charges, at approximately 8:30 a.m. on Thursday, March 28, 104th Precinct patrol officers were flagged down by a pedestrian on Hart Street who had observed Lin allegedly on top of the victim, his daughter-in-law, Wen Ying He, 50, strangling her with a scarf in the rear of the family’s home on Suydam Street near Cypress Avenue. Neighbors were able to tear Lin away from He; but he emerged from the house moments later with a large kitchen knife and began to attack He again. “Cops found Lin on top of his daughter-in-law. When they pulled him off her, they discovered her throat was slashed open,” authorities told the New York Daily News. He sustained several lacerations to her neck. Responding cops made heroic efforts to save her life—one officer covered the gaping wound with his hands and talked to the victim, who was in and out of consciousness. He’s heart stopped at least once on the way to Wyckoff Heights Medical Center, but she was resuscitated. However, the deep gash to her neck was too extensive and she died two days later. If convicted, Lin faces up to 25 years to life in prison.